A great irony of precious metals is the way the financial services community characterizes them as “alternative assets.” For example, most financial advisors hesitate to recommend silver investing in spite of the metal’s proven track record of rising in value during some of the most difficult financial periods in our history. Silver can not only provide profit, but help protect the rest of your investments. Precious metals have been revered the world over for thousands of years as stores of value and highly regarded mediums of exchange. Silver ingots were prized as currency in Ancient Greece, and it is said the worldwide silver trade from the 16th to the 18th centuries was the real genesis of our global economy. To this day, in unsettled economic environments when paper assets are suffering, silver has shown the capacity to not only rise, but soar, providing tremendous wealth opportunities to those astute enough to own it. Nevertheless, silver is routinely dismissed by the mainstream as an asset worthy of your investment dollars. This dismissal speaks to a bias in the financial industry narrative that endangers portfolios unnecessarily. 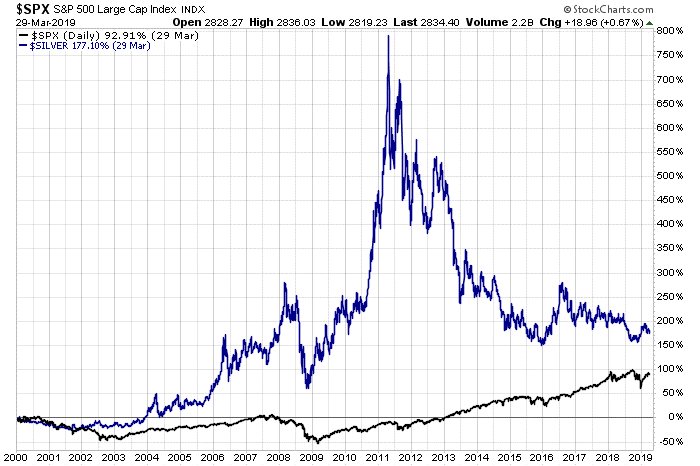 Not only does physical silver have a record of rising sharply during financial crises and economic upheaval, but it has actually outperformed the stock market since 2000, also proving itself a worthy asset for capital appreciation. And yet, I defy you to find a financial advisor who would recommend that you purchase physical silver under any circumstances. The chart below illustrates the fact that silver not only has actually outperformed the S&P 500 since 2000 but has a capacity to soar during financial crises, as it did during the years of the 2008 global recession. Fortunately, not everyone sees silver as an “alt-financial” asset. In fact, there are some very distinguished minds in the field of economics who recognize the tremendous value of silver to investor portfolios. One of those is Dr. William Silber, the Marcus Nadler Professor of Finance and Economics at the Stern School of Business at New York University. Silber has served as Senior Economist with the President’s Council of Economic Advisors and has been a member of the Economic Advisory Panel of the Federal Reserve Bank of New York. Dr. Silber recently penned an opinion piece for MarketWatch in which he makes what can only be described as a compellingly smart case for owning the metal, as well as for buying it right now. Silber’s essay is measured, thoroughly reasoned, and should be required reading for every investor. The ageless storehouses of gold and silver work when nothing else does, like during the Great Recession. Both precious metals are excellent investments to hedge against unforeseen risks. Silver makes sense because it is cheaper, rises faster than gold when disaster strikes, and is easily divisible into small coins, just in case you need to buy a loaf of bread or an iPhone and paper currency doesn’t work. Gold also belongs in a portfolio, because a small amount goes a long way in settling obligations. But right now silver is a much better bargain. It has declined by more than 65% from its 2011 peak while gold is off by about 30%. Portfolio insurance is cheap today. If you own silver, hold on. If not, buy it. There is so much wisdom in this passage, starting with the first sentence. As Dr. Silber points out, the power of precious metals to serve as stores of value in a way no other asset can has not been diminished by the mere passage of time. 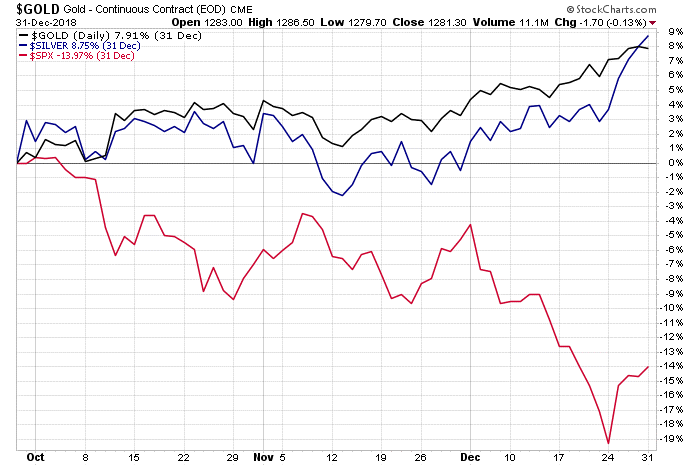 Nothing else has emerged to show it can do what precious metals has done when economic conditions sour greatly. Then Silber really brings his argument home: “Silver makes sense because it is cheaper, rises faster than gold when disaster strikes, and is easily divisible into small coins…” In other words, while gold is clearly a portfolio must-have – something Silber also says elsewhere in his piece – there are characteristics unique to silver that can make it preferential even to gold in some circumstances. As Silber notes, silver is cheaper than gold – much cheaper. Not only is it regularly a lot less expensive than gold, it is especially cheap right now. Presently, an ounce of silver can be had for 1/86th of the price of an ounce of gold. This metric of the gold-to-silver ratio means that silver is currently about as cheap as it has ever been relative to gold’s price, and suggests that silver is significantly undervalued and an even-greater-than-usual bargain right now. Silver’s decidedly lower cost creates interesting pathways to precious metals for investors at different levels. At a little over $15 per ounce right now, sophisticated investors can more easily purchase larger quantities of silver than of gold, while investors with fewer resources can still afford to buy a sizable amount of a physical precious metal. As for Silber’s take that silver rises faster than gold when trouble strikes, we’ve seen that before. For example, in just the last quarter of 2018, when the stock market tumbled roughly 14%, gold rose 8% and silver jumped 9%. But even more than the speed at which silver can rise compared to gold is the truly atmospheric heights it can achieve. For example, during the 1970s, seen by many as America’s worst economic decade since the Great Depression, gold jumped an unbelievable 1,500% … but silver rose an unimaginable 2,100%. Silber also points out silver’s greater “spendability.” For those interested in precious metals’ utility as a medium of exchange in the present and future, silver’s low per-ounce cost lends it to having greater portability and spending practicality than gold. But silver is not the perfect asset in the way that no asset is perfect, and Silber is careful to point that out, too. Silver, writes Dr. Silber, should be seen objectively “as an investment, part of a portfolio along with other assets.” It is both an important and simple assessment. Do you own silver? If you don’t yet own any precious metals, the answer is obviously, “No.” But maybe you are someone who’s put all of their faith in gold up to this point. As you’ve hopefully seen by now, that could be a mistake. To learn more about adding silver to your base of assets, call Augusta Precious Metals at 855-242-4121 and speak with one of our knowledgeable gold and silver professionals. Augusta prides itself in offering the most beautiful and sought-after silver coins available, many of which are eligible for purchase in a gold and silver IRA. Speaking of precious metals IRAs, if you don’t have one, ask the Augusta representative you speak with to give you more information about how you can buy your physical gold and silver from within a tax-advantaged retirement account.